MW124 1/8 scale 1954 Finisterre Sparkman & Stephens racer/cruiser at 57 3/4″ length! The first Finisterre yacht was commissioned by Carleton Mitchell, of Connecticut and launched in 1954. The designers, Sparkman and Stephens were asked to respond to the C.C.A. (Cruising Club of America) rule at the time of her design, which favored short waterlines, extreme beam, and light ballast. 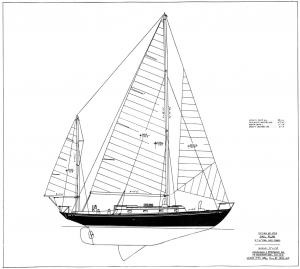 She was not designed as an all out racer but as a reasonably comfortable, shallow draft, cruising yacht for two people. It was the skill of her owner and crew that made her into a legendary ocean racer. She won three Bermuda Races in a row and soon every major designer was using cues from her design. We were commissioned to cut frames for a scale model of Finisterre from drawings first found in the January/February 2011 edition of Wooden Boat. The first order of business was to scan the magazine page and then insert the drawing into the 3D CAD program. From there, we carefully traced the stations in order to create the frames in the right positions. Next, these lines were converted to the bulkhead positions, offset by the required amount for the planking, and positioned on a full-size drawing for verification. 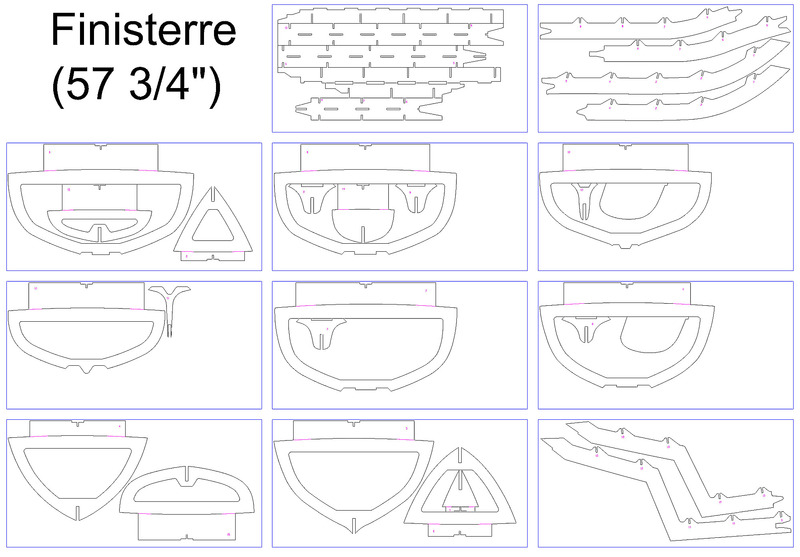 From there the parts are arranged and distributed onto 12″ x 24″ templates for the laser cutter. Some large pieces are divided at this point to make them fit. 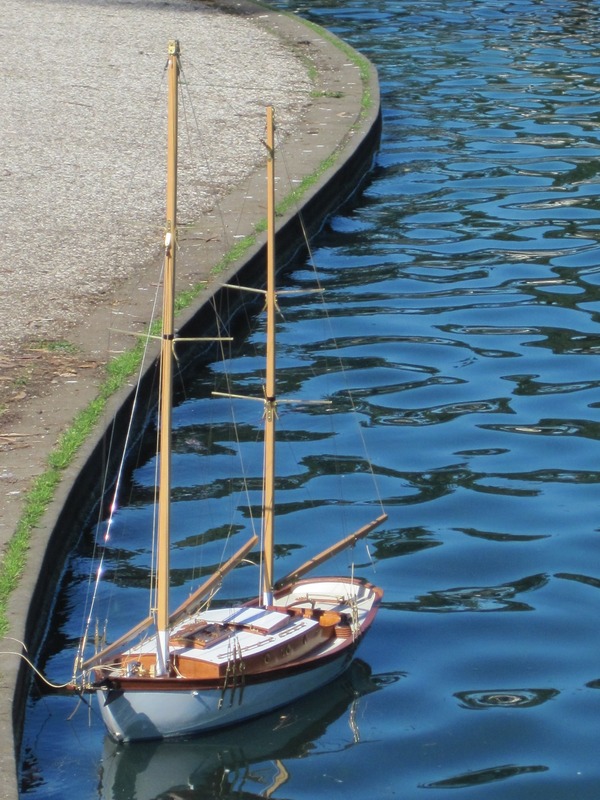 It’s hard to get a sense of how big a 58″ sailboat is. 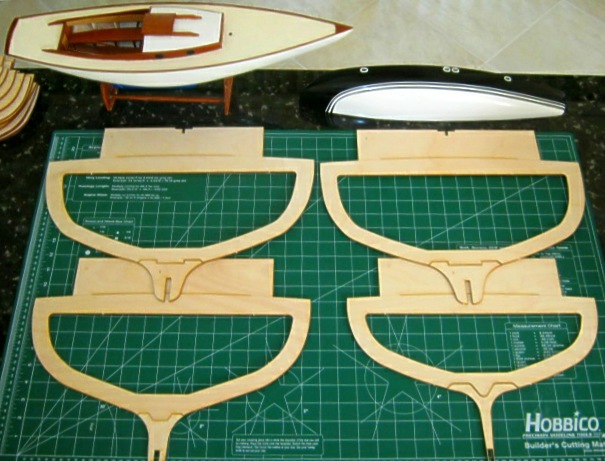 Here are a few frames laid out beside a typical Sound Interclub R/C sailboat. The beam of the model is a little over seventeen inches. Here is a good picture of the frames being assembled. Our t-rail really helps align the frames but it is important to attach the whole structure to a flat tabletop and align and attach the t-rail properly before starting the assembly of the frames. It’s really nice to get feedback from clients. From time to time we get lovely pictures like this one. In a few minutes, this boat will be at sea, enjoying a sunny Sunday afternoon sail. We were pleased with how this model turned out and are looking forward to designing and building the next set of frames for a lucky owner.